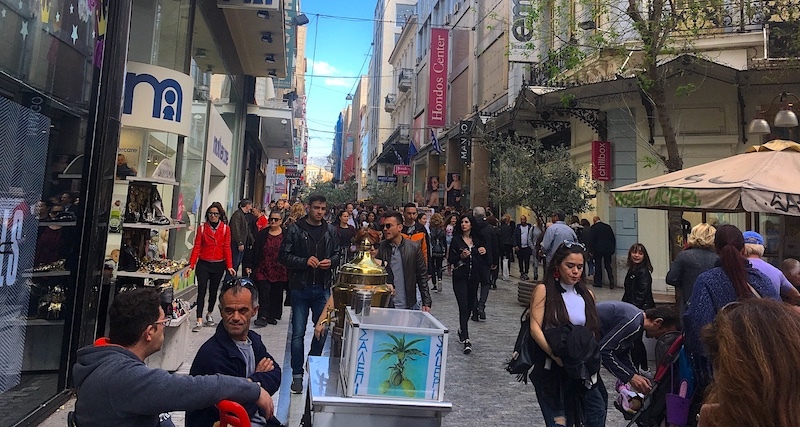 In a recent note, Global X ETFs exchange provider, notes “Greece’s stock market is off to a strong start in 2019, helped by the country’s broad economic growth reaching its fastest annual increase since 2007. In Q1, the markets were up 15.2% and forecasts put 2019 GDP growth at annualized 2.4%, versus Europe at just 1.3%”. in 2019, we see a healthy rise on the indicators shown below. The GREK fund is a good indicator since represents 17% weight to consumer discretionary stocks. This means strengthening of the Greek consumers. Recently, Greece issued its first bonds since exiting its bailout program, and the demand was received as a strong indicator to what is viewed as another positive step toward normalcy. Athens’s debt office sold about €3 billion in sovereign bonds, the country’s first bond issue following various bailout packages. Those bonds yield 3.6%. In addition, the country is also planning an 11% increase to its minimum wage, a sign that the days of austerity maybe coming close to an end. 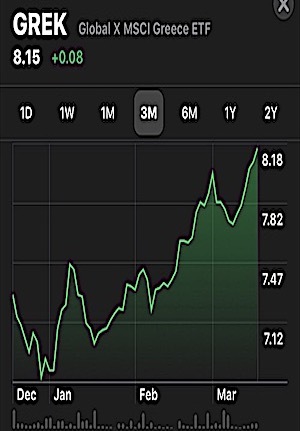 There are signs of improvement in the economy, and one ETF [GREK] could continue to garner the attention of tactical investors this year if Greece makes good on expectations of steady economic growth – GDP growth forecast of 2.5 percent for 2019. “Greece’s economy will expand by around 2 percent in 2019, the influential Greek Foundation of Economic and Industrial Research (IOBE) think tank predicted on Tuesday, slightly below a previous forecast of 2.4 percent,” according to Reuters. 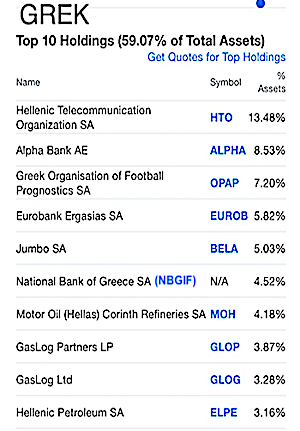 GREK is a $240.87 million ETF which follows the Greek equity market with just 34 holdings, concentrated in energy and financial services. Currently it has an ETF Daily News SMART Grade of C (Neutral), and is ranked #64 of 91 ETFs in the European Equities ETFs category. This HEC website is dedicated to economic growth in trying to identify helpful ways for improvement. Anyone can participate and discuss ideas or offer proposals for the common good. This is the area for discussions about the project.